How popular is my website? Open the Audience section in the Google Analytics sidebar. The Sessions report tells you how popular your website is. Ideally, this graph goes up over time as your site gets more followers and links from other websites! 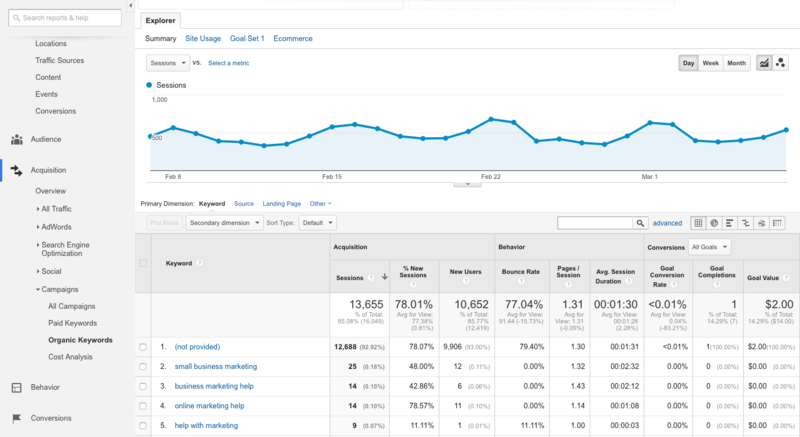 The Google Analytics Sessions report tells you how many visits your site is getting each day. The report shows you the number of sessions, or visits to your site, over a given amount of time. 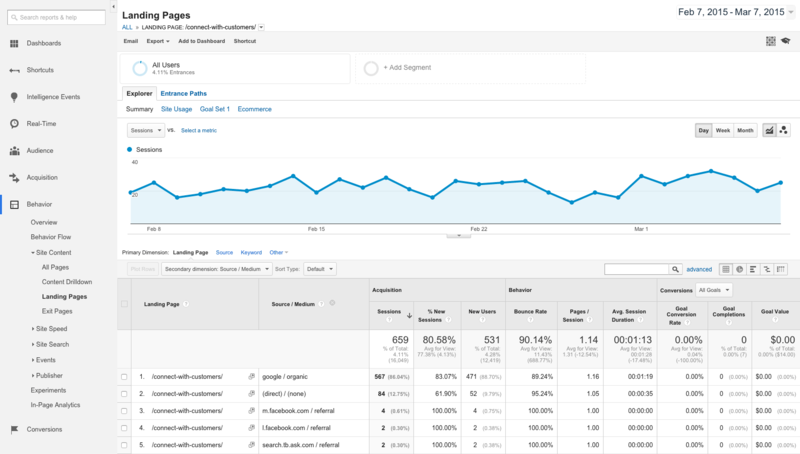 When a person first visits a page on your site, Google Analytics records a new session. If the person then visits other pages on your site within 30 minutes, that’s still counted as part of the same session. However, if they wait longer than 30 minutes before viewing another page, that’s counted as a new session. How interested are my visitors? So you know how many visits your site’s getting, but are those visitors actually interested in your site’s content? The Pages / Session (pages per session) report gives you an indication of how much your visitors are interested in your site as a whole. It shows the average number of pages that people view during each visit. Click the Sessions drop-down list toward the top of the page and choose Pages / Session. Most people will follow a link to a page on your site, read the page, and then close the browser tab or use the Back button to return to the previous site they were viewing. This is known as a bounce, and it’s particularly common on blogs, where people tend to read just one article at a time. However, a certain proportion of readers will think that your website or blog looks interesting, and click a link in your page to visit another page in your site. The higher the Pages / Session figure, the more people were tempted to explore your site deeper, rather than just closing that browser tab. 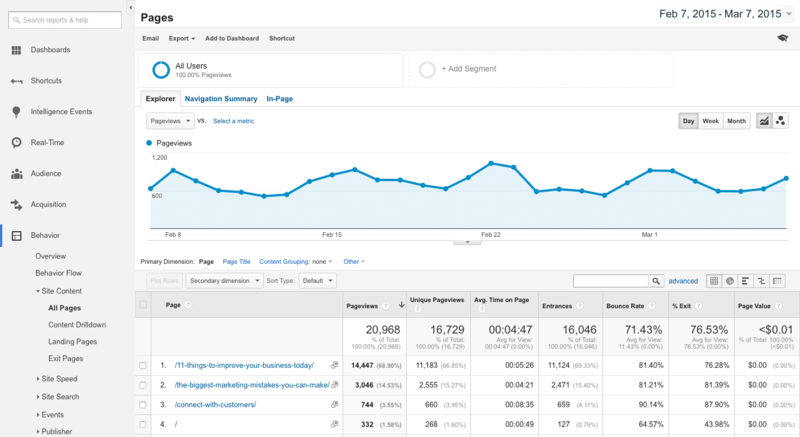 The Pages / Session report gives you an idea of how engaged your visitors are with your content. For a typical blog, you can expect Pages / Session to be fairly low — usually somewhere between 1 and 2. For sites where the visitor typically views a lot of pages — such as an online store — you’d expect this figure to be higher than 2. After you make any change to your page layout — such as adding a “Popular Articles” list to your sidebar — check this report to see what effect it’s had on your visitors. Which content on your site is the most popular? 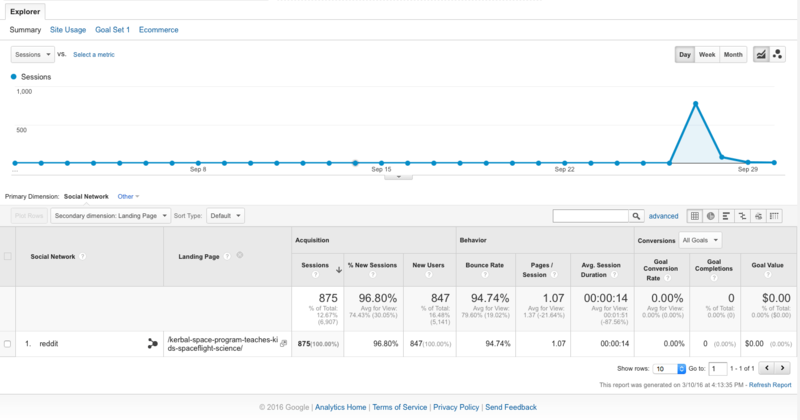 The All Pages report shows you, at a glance, which pages on your site are visited the most. Open the Behavior section in the Google Analytics sidebar. Open the Site Content subsection. Click the All Pages link. The table below the timeline graph lists all the pages in your site. For each page, the Pageviews figure shows you how many times that page was viewed over the specified time period. The table in the All Pages report shows you your site pages, ordered by the number of pageviews. If you’d rather see the page titles than the URLs, click the Page Title link above the table. Usually (although not always), the most-visited pages contain the content that most interests your visitors. So it’s worth taking a look at these pages to see what kind of content your readers seem to like. You might then choose to create more of that type of content, or cover those topics in more detail. How can I examine my stats over different date ranges? Click the date range in the top right corner to reveal the date picker. To select a range of days, first click the start day in the calendar, then click the end day, as shown in the screenshot below. To select a single day, just click on the day in the calendar twice. To pick a pre-set date range — such as today, yesterday, last week, or last month — select an option from the Date Range drop-down menu. When you’ve selected your date range, click Apply to update the report. To select a custom date range, first click on the start date in the calendar, then click on the end date. One really nice feature of Google Analytics is the way you can compare two date ranges in any report. 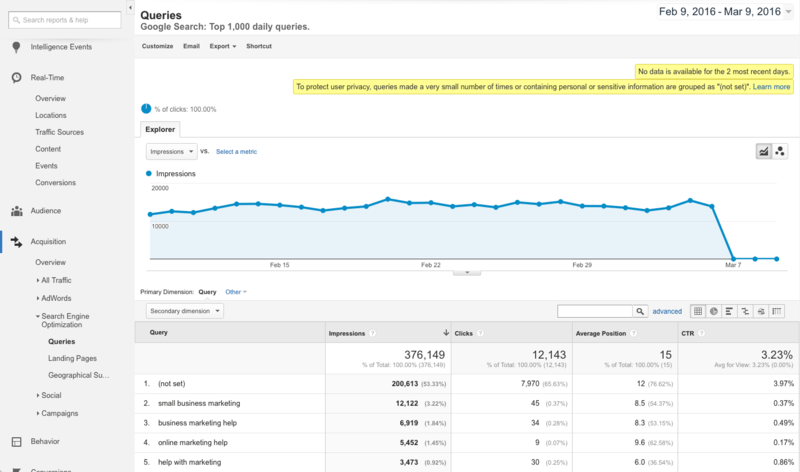 This is great for seeing how your site’s traffic changes from, say, one month to the next. To compare two date ranges, click the Compare to checkbox, then choose an option from the drop-down menu. This defaults to Previous period, which compares it to the period immediately before the date range you selected. You can change it to Previous year to compare the current range with the same range last year, or Custom to select your own date range from the calendar. Comparing two date ranges in the Google Analytics date picker. Try to compare ranges that are multiples of seven days — for example, a whole week or a whole fortnight. Visitor habits can vary wildly between weekdays and weekends, so comparing different parts of a week can skew your results. 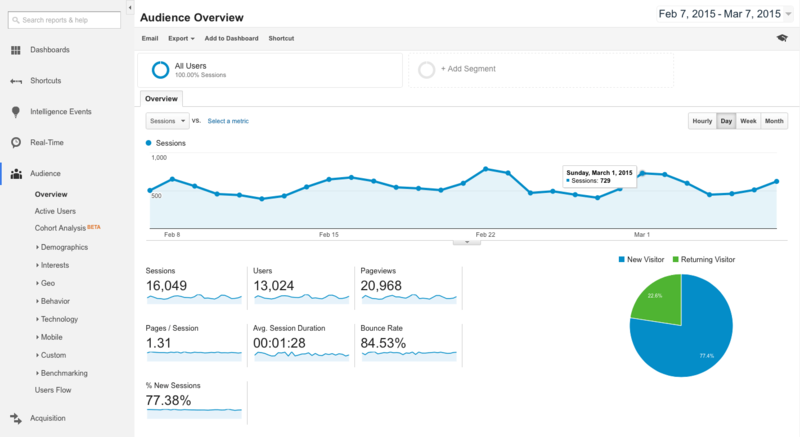 How can I access my most important stats quickly in Google Analytics? 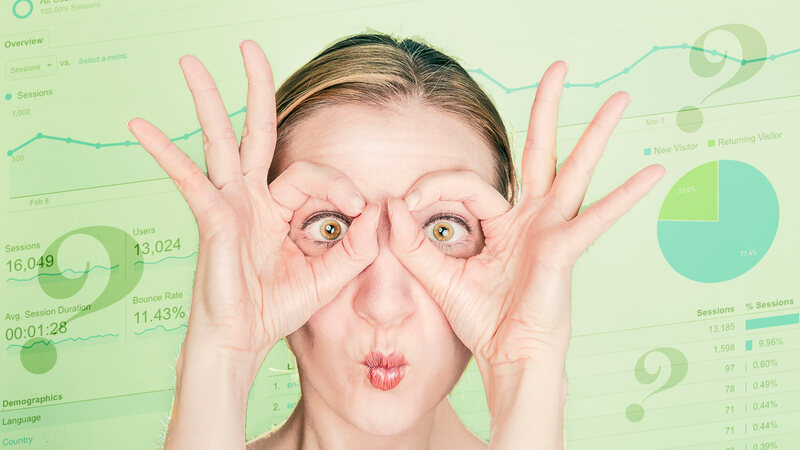 You’ve probably experienced that overwhelming feeling where you jump around from one Google Analytics report to another, trying to remember data from the first report while you look at the next. Wouldn’t it be so much more relaxing to have all your important data on one screen? For example, you could create a dashboard that shows a timeline of your recent visitor sessions, another timeline showing pages per session, and a table that lists your most popular pages. 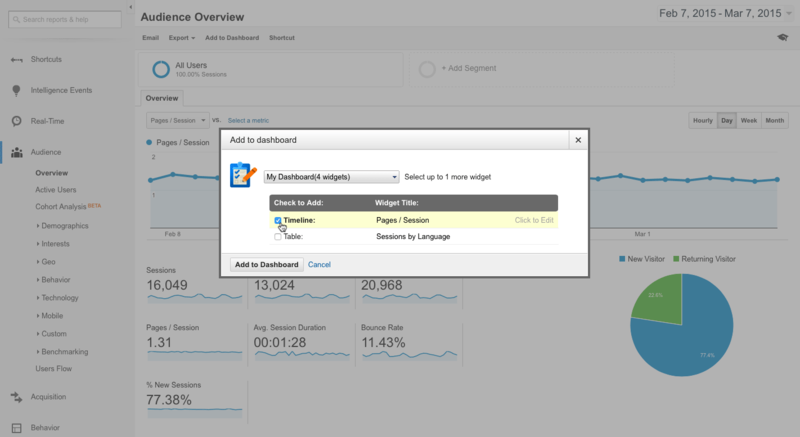 Open the Dashboards section in the Google Analytics sidebar. Click the New Dashboard link. Click the Blank Canvas button, then type a name for your dashboard. Click your dashboard’s name inside the Private subsection. View the report that contains the widget you’d like to add to your dashboard. Click the Add to Dashboard link at the top of the page. Select your dashboard from the drop-down menu. Click the checkboxes next to the widget(s) that you’d like to add. Click the Add to Dashboard button. Adding the Pages / Session timeline to a dashboard for quick and easy viewing. How can I find out what’s happening on my site right now? Most data in Google Analytics takes several hours to update. Normally this isn’t a problem, but if you’ve just started a big ad campaign or social media push then you might want to see what immediate effect it’s having. 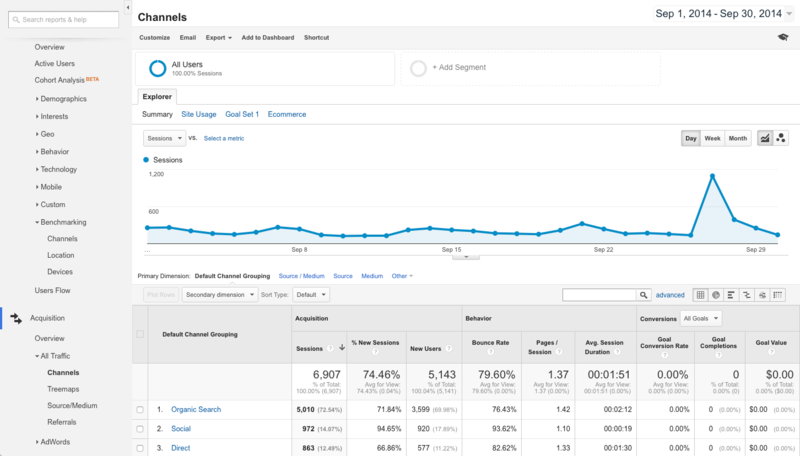 Open the Real-Time section in the Google Analytics sidebar. At the top of the page, you’ll see a summary of your traffic at the moment. The big number in the top-left corner shows “active users” — that is, the number of people viewing pages on your site right now. The top-right timeline shows the number of pages viewed in the last 30 minutes or so. Further down the page, you can see where your current visitors are coming from (Top Referrals), which social media they were using (Top Social Traffic), and which keywords they were searching for to reach your site (Top Keywords). Top Active Pages shows which pages your visitors are viewing at the moment, and Top Locations shows where these visitors are in the world. 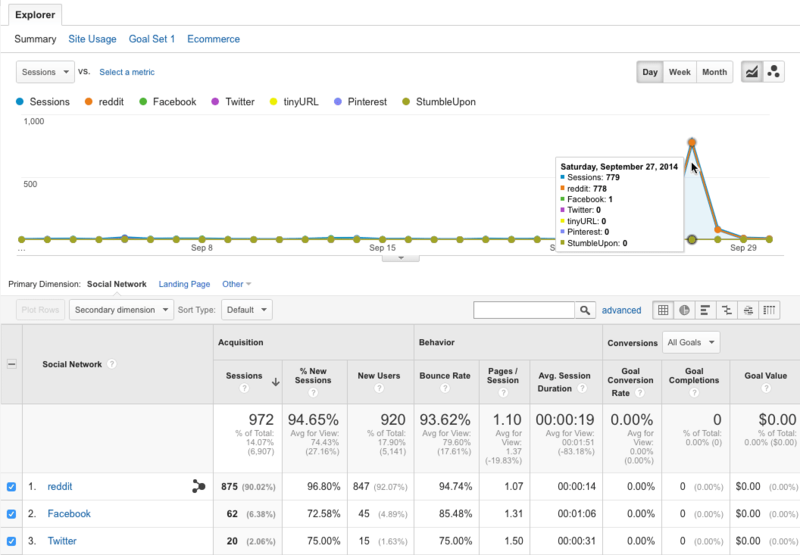 Google Analytics’ Real-Time Overview report lets you see what’s happening on your site right now. How can I see what people are searching for to reach my site? Most websites get a good chunk of their traffic from search engines such as Google and Bing. Finding out which keywords people search for to reach your site helps you understand the type of audience you’re attracting. It can also give you ideas for future products, services or blog posts that you might like to create. 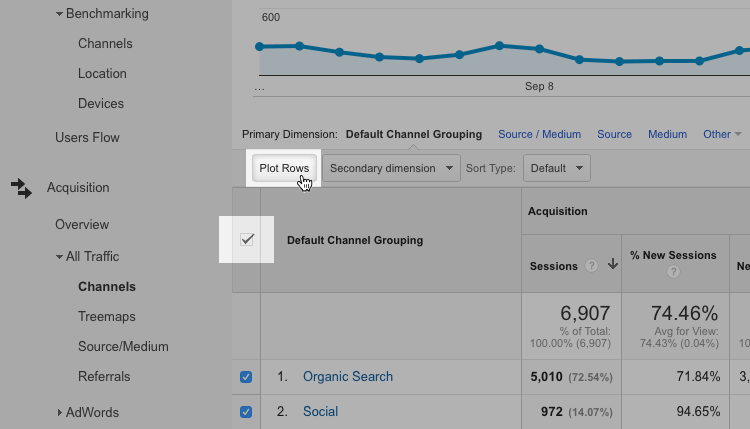 Open the Acquisition section in the Google Analytics sidebar. Click the Organic Keywords link. The table at the bottom of the page shows you the keyword info. You can see a blue list of keywords in the left-hand column. To the right of each keyword, you can see how many people reached your site with that keyword (under Sessions), as well as other useful info such as the bounce rate per keyword. The Organic Keywords report shows you a selection of the keywords that people search for to reach your site. Notice that most of the sessions are tagged as (not provided). That’s because most people search Google while logged into their Google Account, and logged-in searches can’t be tracked directly using Google Analytics. All is not lost, though — there is a way to access most of those keywords too! If you haven’t already done so, add your website to Search Console. Click on your website in Search Console to bring up the Dashboard. 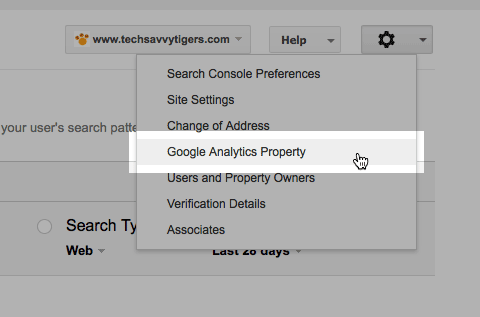 Click the top-right “gear” button and select Google Analytics Property from the drop-down menu (see screenshot below). Provided you’re logged into the same Google Account that you use for Analytics, you’ll see a list of one or more properties appear under the Analytics Web Property column. Click the property that you want to link to your website in Search Console, then click the Save button. Click OK in the Add Association dialog box that appears. 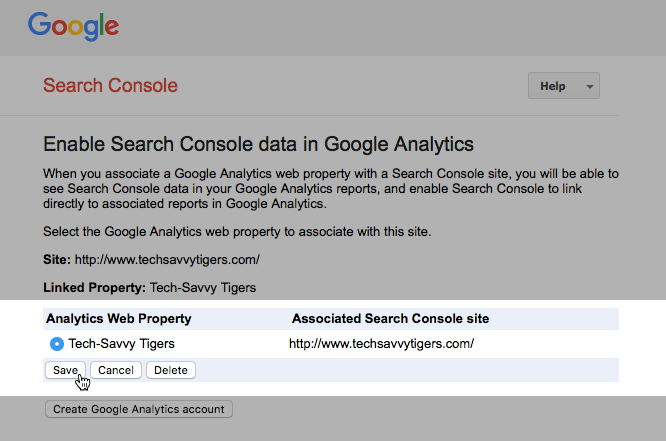 …then select your Google Analytics property in the list and click Save. Open the Search Engine Optimisation subsection. You’ll notice that this has a lot more keywords in than the Organic Keywords report! That’s because they’re pulled straight from the Google search engine via Search Console. For each keyword, you can see how many times your page link appeared in Google search results (Impressions), how many times people clicked through to your page (Clicks), the average position of your link in the search results (Average Position), and the click-through rate (CTR). The Google Analytics Queries report gives you a lot more detail on the keywords that people are using. Infrequently-searched keywords are marked as (not set). Only the last 90 days of query data are available. Despite these drawbacks, the Queries report is worth studying if you want to get a good idea of what your visitors are searching for in Google. How are people reaching my site? Knowing where your traffic comes from can be immensely helpful. It can help you decide where to focus your marketing efforts and it can give you insights into the type of audience that enjoys your products, services or content. You’ll see a pie chart and table showing the main traffic channels, including Organic Search (non-paid searches on search engines), Referral (links from other sites), Social (social media like Facebook and Twitter), and Direct (people clicking links in emails, opening bookmarks, or typing your URL directly into their browsers). 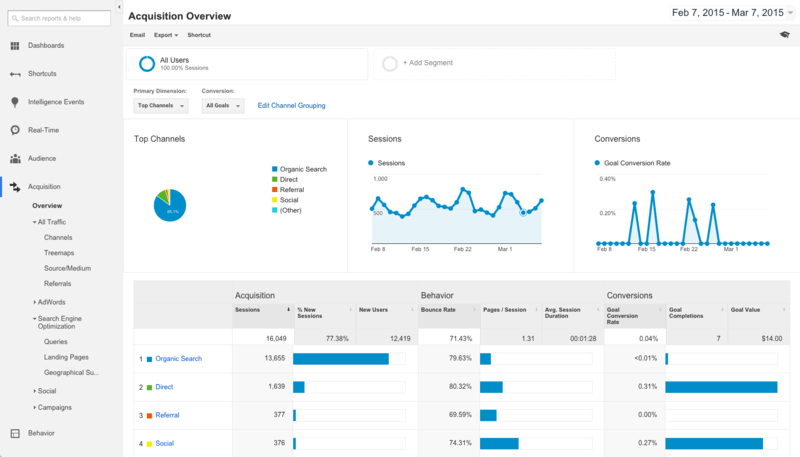 The Acquisition Overview report shows your main traffic channels. Click each channel to drill down further into your traffic sources. Click one of the channels in the table to reveal more detailed information about that channel. For instance, if you click Organic Search, you’ll see some of the keywords people use to reach your site. If you click Social, you’ll see all the social networks that send you visitors. If you click Referral, you’ll see the websites that send you traffic. And it gets better! Click on an individual website in the table, and Google Analytics shows you the exact URLs on those sites that are linking to you. You can then click the tiny “arrow” icon to the right of the URL to visit the page and see what they’re saying about you! If you drill down into the Referral channel, you can go right down to the level of individual pages to see exactly where your traffic came from! How are people reaching a particular page on my site? Click the Landing Pages link. In the left-hand column of the table, click the URL that you want to investigate. This opens another report that covers just that page. Click the Secondary dimension button just above the table. In the menu that appears, click Acquisition, then click Source/Medium. The table now changes to show you all the different ways that people reached that particular page. For example, “google / organic” means those people came from a Google search, while “example.com / referral” means that those people came from a link on the example.com website. 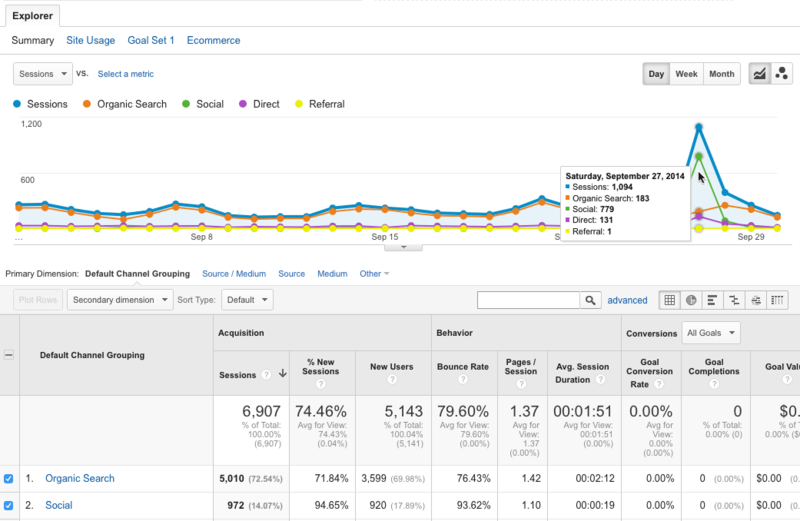 For each traffic source, the Sessions figure shows you how many people came from that source. By adding a secondary dimension to the Landing Pages report, you can see all the ways that people reach a given page on your site. How can I discover what my visitors want to know about? Most of us would love to know what our visitors and customers really want. Knowing your readers’ desires makes it much easier to develop products and content that they’ll love. Sure, you can conduct surveys and costly market research campaigns. But did you know that you can use Google Analytics to discover what your readers want — using their own words? The secret is to link Google Analytics with the search function on your site. (Most content management systems, such as WordPress, have a “search the site” box that appears in the sidebar or footer.) Then, whenever a visitor uses the search box to look for something that they want to learn about, the words they type in will appear in Google Analytics! The bit you want is the chunk of text before “=frogs” and after any other non-word character. In this case, it’s searchText. That’s your query parameter. If you’re using WordPress, the query parameter is usually just s (the letter ‘s’). Click the Admin link at the top of the page. Click the View Settings link in the right-hand column. 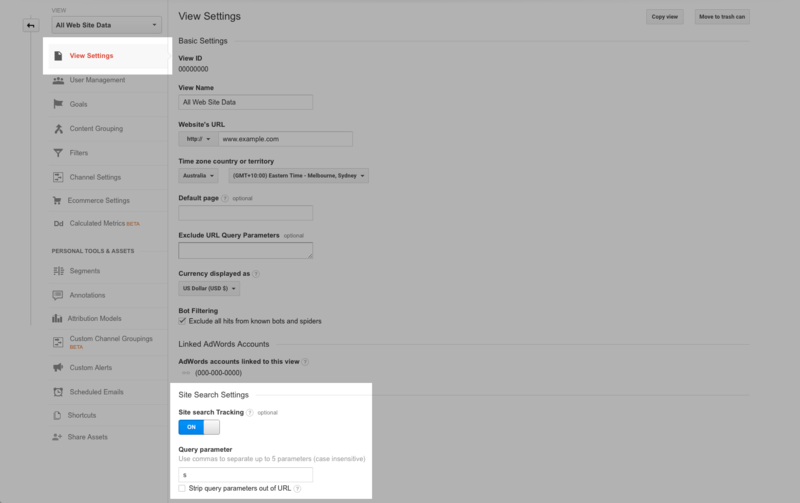 Under Site Search Settings, turn on the Site search Tracking switch. Below the switch, enter the Query parameter that you worked out earlier. Click Reporting in the top menu to return to your reports. To set up Site Search, use the Site Search Settings section under Admin > View Settings. Open the Site Search subsection. Click the Search Terms link. You’ll see the number of searches over time in the top timeline, and the actual search text in the table below. Over time, you’ll see which searches are the most popular. Now you know what your site visitors are after! 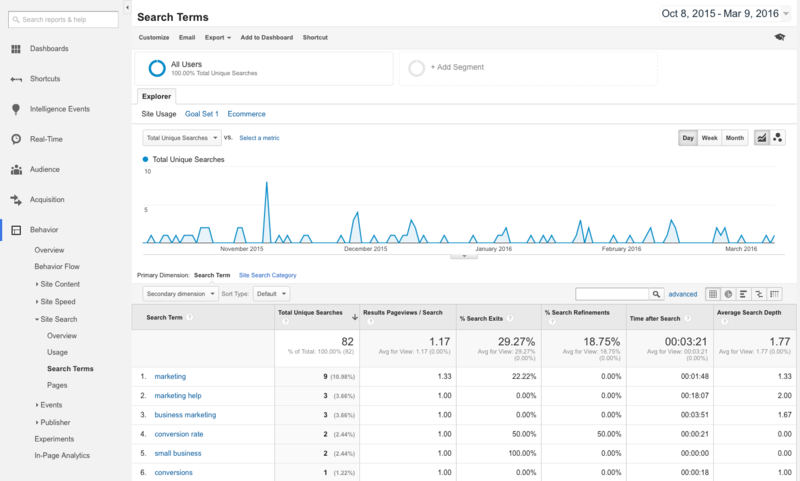 Once you’ve set up Site Search, the Search Terms report shows exactly what visitors are searching for on your site. How can I find out where a traffic spike came from? 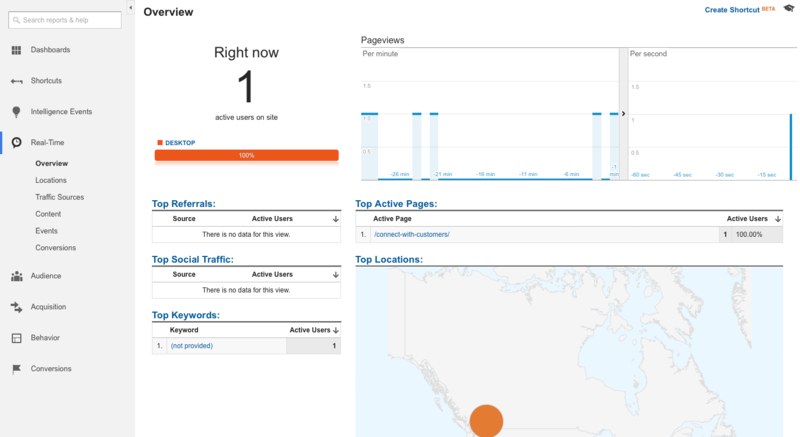 Ever opened your Google Analytics to find you got a truckload of traffic a few days ago? Here’s a little trick that quickly shows you where all those lovely visits came from! Open the All Traffic subsection. This traffic spike happened on one of my sites in September 2014. Click the checkbox on the left side of the dark grey table header (see below). This selects all the channels in the table. Select all channels by clicking this checkbox, then click the Plot Rows button. Now, that single timeline graph at the top of the page splits up into several coloured lines. Each line represents the amount of traffic that came through a particular channel. Hovering over my traffic spike reveals that most of the traffic came from social sites. Click the Social channel link in the bottom table to reveal all the social networks that sent traffic to the site. Drilling down into the Social channel, it’s clear that most of my traffic spike was from a link on reddit. Click the reddit link in the table to display just the traffic from reddit. In the menu that appears, click Behavior, then click Landing Page. The table now changes to show the exact page that was shared on reddit (in my case it was a blog post on the Kerbal Space Program video game). Useful stuff to know! We can even drill right down to find out which of our site’s pages received all that reddit traffic! Get answers to those burning questions today! 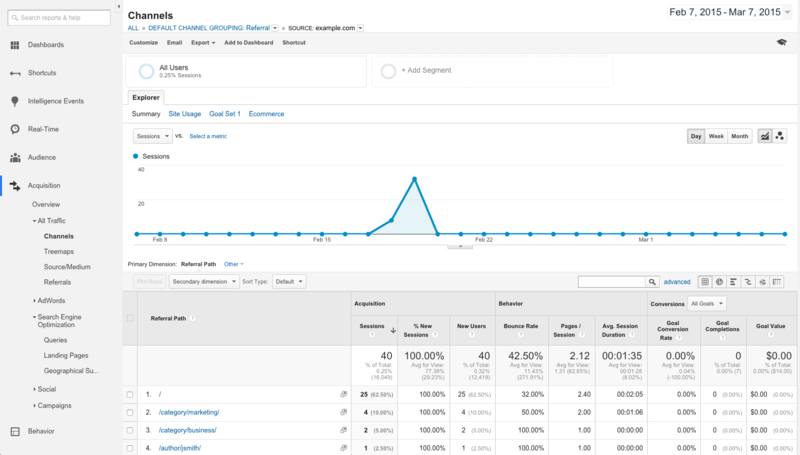 Google Analytics can seem overwhelming at first glance. It’s tempting just to check one report every now and then, or — even worse — ignore your stats completely! However, if you regularly take just a few minutes each week to check some of the reports listed in this article, you’ll start to get really deep insights into how your website is performing. You’ll understand your audience better; you’ll be able to create products, services and content that they really need; and you’ll discover ways to improve your site and create a nicer experience for your visitors. So fire up your Analytics today. Pick a couple of ideas from this list, and start delving into your stats. You’ll be amazed at what you discover about your website — and your customers! I spent over an our and a half playing about with the sidebar and corresponding reports, which is definitely the most focus I have ever given my metrics! I now have a dashboard set up and feel happy that I will always be able to check on the things I care about most easily. Cheers Matt, this was really useful for the neophyte! Very useful Matt. I’ll be putting this into practise today. Thanks for your comment Anita! I’m glad you found the article useful. If you have any questions, please feel free to ask! Thanks Matt, read your article and was particularly interested in the bit about traffic spikes, so I looked at where a particular spike had occurred and it was paid searches but when I drilled down it said Not Set. I’m using Google Adwords Express at the moment… can you shed any light on that one? Thank you. What an amazing amount of free information. I shall be coming back to this later and making full use of it! This article is just what I’ve been looking for! All of my questions answered, in a way I can understand easily. Thank you so much, Matt & Cat! I am looking forward to re-reading it with Google Analytics open so I can play with it. I’m so happy to finally learn how to use Google Analytics better! Thanks for pouring your brain on this article.